"This dish incorporates a lot of what I love; crunchy sugar snap peas, assorted veggies, and a creamy dressing. A sweet and satisfying side dish!" 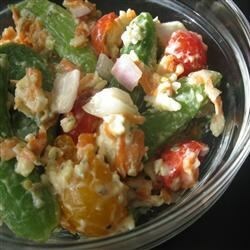 Snap large pea pods in half, and place peas in a salad bowl with cherry tomatoes, carrots, red onion, mayonnaise, Parmesan cheese, oregano, parsley, rosemary, salt, and pepper. Gently toss to combine all ingredients and coat with dressing, and refrigerate salad for at least 1 hour before serving. If you do not have the assorted seasonings, simply use an Italian seasoning blend. Add or subtract veggies to your taste. Sugar can be added in with the mayonnaise for a sweeter dressing. Very nice. Interesting flavor. I didn't have tomatoes today - but next time I will add them. Thank you! Better the next day. Added a bit more carrot because it was left from the shredding. Would make again.